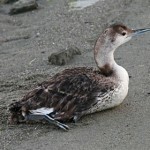 “Raspy,” “hoarse,” and “screeching” are adjectives frequently used to describe the quality of Pacific Loon. Description: Sexes similar. White below, black-brown above; crown and nape are paler than back; cap extends to eye; crisp line of separation between black and white along side of neck; usually thin “chinstrap” of brown spots on white throat. Juveniles similar but browner above. 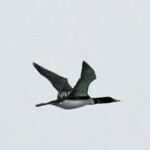 In flight, resembles Common Loon but head and feet are smaller. Habitat: Larger lakes and reservoirs. In summer, western reservoirs are used more. Nebraska Seasons: Best time to view is early to mid Nov.
Where in Nebraska: Rare regular fall migrant statewide. Rare casual spring migrant statewide. No breeding records in Nebraska. 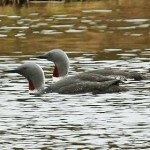 Field Notes: Prefers deeper water than other loons. 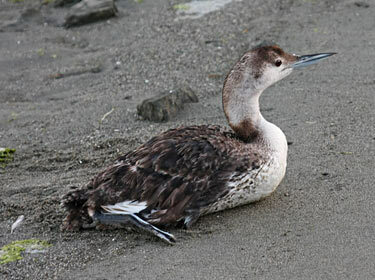 Fun Facts: The Pacific Loon is extremely awkward on land and cannot take flight from land at all.